Though I made it through childhood without a formal diagnosis, there was never any doubt that something was wrong. I heard about it at home, at school, even from strangers who stared in stores and restaurants, somehow knowing. What I knew about the something, independent of the tellings and looks, was that while being alone was fine, loneliness grew in every attempt to join the others. I could not talk to people, and I did not like them looking at me, waiting. When I was 18, I found the cure. The cure came in bottles, 12 ounce amber ones and tall clear ones with Russian names. I found a voice, and I thought it was mine. For years I drank nearly every day. I went to parties, nightclubs, and the homes of people I knew and didn’t know. I danced and sang. I talked to people. These were a few of the things I did which did not harm anyone. I could write volumes about the things that did. I was cured, for a time, of a certain form of communication deficit, and I learned to enjoy, for the first time ever, socializing with others. As far as the third part of the triad, the repetitive, obsessive part, well, not so much. Alcohol made the obsessions much more visible to others. I was not normal, not at all indistinguishable from my peers. Those obsessions, lasting anywhere from months to years, might have been manageable, might have passed for mere “quirks” to the casual observer before my cure, but these became the fuel for numerous conflicts, employment problems, threats of arrest, ludicrous piles of debt and falling from roofs onto wrought iron patio furniture. The details are not ones I care to discuss much here. Eventually, the cure I had sought became a clear threat to my life. I had to give it up; yet this seemed impossible. I needed a cure for the cure, so I went to Alcoholics Anonymous, where I was told there was none. However, I was guaranteed a “daily reprieve” from alcohol if I became willing to follow a few simple rules. Because I could find no other option, I agreed to do this. Life improved, quickly in some areas, slowly in others. It should be noted here that the story repeats like this: Seven years of drinking, seven years sobriety, seven more years of drinking. Then on to the current recovery period, now in year eleven. What I am wanting to say here is twofold. Sometimes the cure is worse than what one is seeking to alleviate. Alcohol allowed more words to flow, but the words were not good ones. They no more represented my true self than my silence had. Likewise, the behaviors of children subjected to barbaric "interventions" at the Judge Rotenberg Center may seem improved to some, but at what cost? Beyond that, I often wonder, when people seek treatments for “autism” exactly what it is they are hoping to treat. 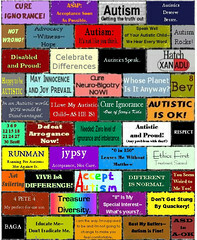 Autism is not one thing. My understanding of how it looks in me includes things like difficulty with spoken language (sometimes very little language is available, sometimes the words don’t match with what I mean to communicate); interests that differ in both type and intensity from most other people I know; repetitive movements and sounds; marked differences in information processing; problems with initiating and switching tasks; mild prosopagnosia; strong aversion to sounds most people don’t even notice; a stiff bouncy walk that sometimes draws comments and stares; general clumsiness; severe problems with sleep (waking as many as 20 times during a night); debilitating fears of things like thunderstorms and ants; unusual postures; inability to use facial expressions consistent with my intent or meaning; significant difficulties with managing time, finances and household upkeep; mild self-injurious behaviors; echolalia, both immediate and delayed; and the need for keeping an animatronic parrot at my side. That just scratches the surface. How anyone can imagine that one drug, therapy, or other “intervention” might address all of these characteristics (and more!) is something that makes no sense to me. Indeed, it seems that most treatments for “autism” address at best a handful of items from a list far longer than the one provided here. For purposes of promoting particular treatments, “autism” can mean pretty much whatever a parent, therapist, doctor or business decides it means. Much like Humpty Dumpty some people have decided that the word means “just what [they] choose it to mean, neither more, nor less.” Of course it can never mean what I say it means. I lack certain credentials (either autism or the absence of it, depending on whom you ask). Yes, it would be so nice if something made sense for a change. In a future post, which I hope to deliver promptly, executive functioning skills permitting, I will discuss the AA experience, or at least some small parts of it, from the perspective of a (non-recovering) autistic recovering alcoholic. Numerous sources have reported that he was cracked. Thank you Bev, your words are like light in a dark tunnel! Well I am sure everybody knows when Laurentius is drunk in charge of a keyboard, as I cannot pretend it does not happen, hopefully never in an academic context however, but when it comes to the blogosphere anything goes. I guess I have had a few 'adventures' when I was drunk, and I have to admit I do have a fondness for certain kinds of liquor, which are probably the worst kind, for instance Cider and Whisky. They are not good for the general health nor the pocket either which is of more concern to me than what it is doing mentally. It's a mind trick really, getting to that stage where you don't need the drink as a confidence booster, but I am not at all sure that I consider the whole bunch of psychotropics, antidepressants and tranquilisers that one can end up with any less dangerous than alcohol. BTW I am on caffiene this morning, that is not good for me either. BTW I used your social model square cartoon as a slide in a lecture recently, I think it worked. I am very interested to hear your first hand experience. Thank you for sharing this. My nephew, a brilliant young man, had many autistic tendencies growing up, the same as my son, who is adopted. His father self-medicates with alcohol. Many in my family are very successful, I and my brother aren't. I see that in a lot of families with high achievers. It's like somebody has to pay the cost for the gene pool that allows success. My father's family were all what some might consider alcoholics, my Dad owned a bar...but like you, I think it softened the burden of extreme shyness. He never drank but socially. At home, he was quiet, actually. But he had the reputation of a larger than life, big, boisterous personality...probably mostly manufactured by alcohol. Now to my son, adopted. The reason I make that apparent is because it seems it could be environmental...except that his birth father and family had EXTREME problems with drugs and alcohol, and quite frankly, prison. Ben has no lost love for his birth father, sees him as a loser, although there has never been any contact, because of his problems with drugs. I know Ben suffered a lot at school for his "differences", and although he has a higher IQ than me, he was associated with special ed his whole school career,although he also always attended regular classes. When he was 3 years old, the neurologist said he was not autistic, but his differences would be manifested in severe learning disabilities. He is dysgraphic and dyscalculaic. I imagine his father was told all his life, he "just wasn't trying hard enough", or he was "being difficult on purpose", or any of a million other downs put upon kids who are giving it everything they got, which is never good enough for the institution of education. I hope Ben doesn't suffer as his father did. Anyhow, this is a magnificent post. I wonder how many people try to cure autism with booze as adults. Having been around booze my whole life, and not understanding for years that not everybody drank to excess...I think you are definitely on to something here! Thanks for sharing, Bev. I'm really looking forward to your next post. I tried alcohol when I was 13 (my dad offered me a shot of scotch) and I was turned off right away due to its throat-burning qualities and the unpleasant sensation that it gave me afterwards. Since then, I have never drank alcohol. Thanks for sharing your experiences, though, Bev. Akkk! Sorry, Kowalski, I accidentally deleted your comment. It was a good one, I appreciated it, but Blogger will not let me reverse the error. Thanks to everyone for the feedback on this. Except for J.B., whose comment has been intentionally rejected. You're welcome, Bev. I have a habit of drinking a cup of coffee every morning to give myself a boost. According to my friends, I am also more "chatty" when I have just drank coffee. I also like the taste with half 'n half, powdered milk, and sugar. In my case, I feel that the benefits of drinking coffee outweigh the risks because I stopped growing when I was 13 and I always make sure to drink a glass of milk after drinking coffee to prevent both bone damage and dehydration. Jerry Newport, in Mozart and the Whale, talks about LSD "helping" him with friends. When he and his friends used it, his friends became like how he normally was. They could also now stare at a grain of wood for half an hour. SBWG, Thanks. Coffee is the one thing I have pretty much vowed to never give up. Don't even ask how much of that I drink. I know it's bad, but at least I remember everything that happened last night. @Bev: Glad you're not getting stoned on the coffee! Lol. About neurotypicality, did you hear what they're saying about Kennedy? Absolutely ludicrous! Thank you Bev, this is a really powerful read. I've (re)Tweeted it. Bev, you are so eloquent. Thank you for having the courage to speak of this. Thank you for this post. I remember going to New Orleans with a friend when my daughter was 12 or 13, and my friend having a very serious talk with her about alcohol. She said the same things you said her - told my daughter never ever to start because it would trick her into thinking she was acting normal. Thank goodness for your 11 years!!! Links are always okay. I am also okay with people posting the first paragraph and sending readers here for the rest. It looks like I have frightened a few parents; that was not my intention. There were a lot of factors that played into this, and probably the most important was having a genetic predisposition. Not everyone who drinks to relieve autistic "symptoms" will develop alcoholism, and many autistic people will not become heavy drinkers. I'm not sure that we are any more inclined to become substance dependant than the general population. Anyone know of any studies on this? Just to provide another personal counterexample, I learned quite quickly that alcohol was not cure-like with my own autism; in my case, I quickly learned from just a few sips that it just makes me more drowsy and prone to sensory overload and gives me more difficulty getting things out coherently. Which is fine for sleep, but not quite so good for social situations. I wonder how common Sadderbutwisergirl's phenomenon is—I have never understood the appeal of alcohol (my parents actually *forced* me to drink a sip of champagne when I graduated high school and I found it utterly disgusting) and neither does my boyfriend; although he's not "officially" diagnosed while I am, we're pretty sure that we both have AS. This, however, does lead me to being somewhat puritanical about it, which I need to work on reining in! I do love caffeine, though, and I can recall several instances when caffeine made me extremely hyperactive and uninhibited. That's more like the opposite of drunkenness, though—and the closest approximation of drunkenness that I've felt is being sleep-deprived! coolkid, I think this has more to do with having positive self-esteem than getting "treatment" or anything for being autistic. I'd also point out that there is immense variety in how autistic people react to their situations and the pressures which come with being on the spectrum. I'm from a generation which had "don't do drugs" pounded into our heads constantly at school. I took this quite literally. For a long time I thought that anyone who did drugs/drank/smoke was a bad person who was going to try and force me to do it, too, that even trying drugs once or twice would doom me to all sorts of health problems, etc. I even thought, after seeing a scary documentary about the dangers of getting high off of household substances, that being around glue, paint, and other substances might cause me brain damage. I just didn't understand what they meant when they said that "sniffing" glue was dangerous, and hence thought that even breathing around glue could be dangerous. Quite naturally, I never even came close to smoking/drinking in excess/using illicit substances. I'm with Cat on the taste of alcohol; I think it's pretty vile in most forms. Lately I've tried to drink beer because I've been in social situations where everyone else is drinking it, and I haven't been able to get down more than a few sips. I've never really taken enough of it to gauge my response, which is fine with me. I also hate the taste of caffeine in many forms--sodas, coffee that isn't liberally combined with chocolate, energy drinks. So clearly there is a lot of variation. "I'm from a generation which had "don't do drugs" pounded into our heads constantly at school." That's also the case with me and my younger siblings! When I went to elementary school, my school had police officers come in and do the D.A.R.E. program with us. It was all about how "Drugs are bad, mm'kay" and only giving the bad sides of it. Now most people I know from school are either smoking weed or cigarettes or else drinking on a regular basis. Hehehe! No worries, Bev, the same thing happened to me once! Now I can't remember what I said exactly, but it was something like that it was frighteningly similar to my own experiences, except that I learned about autism earlier so I managed to cut it down over the years without help. On another note, I think the dangers of coffee are grossly overrated. I'm with the group that can't stand alcohol. Aside from the horrid taste (I'm very fond of mixed drinks), I don't like what it does to me. The feeling like I'm not totally in control that I get when I'm buzzed, where I'm somewhat detached--I can't stand it. Thanks for this post, Bev. Another self-medicator here. I wasn't trying to cure my autism, not knowing anything about that. I did know that I suffered from paralyzing social anxiety, and that ethyl hydroxide was good against anxiety. Unfortunately, it also gets one drunk, and continued use of it builds up a tolerance, and causes brain and liver damage. What's funny to me, is that some of the "doctor drugs" prescribed for people don't seem to work much better and cause even worse damage. I continue to drink, and try to mitigate the damage with SAM-e.
On the AA thing: I recall a book I read once, entitled "12-Step Horror Stories." I think it was about how some AA meetings were run by the kind of people who drank to be more efficient bullies, and were still bullies when they quit drinking. I'm the other kind of drunkard, as mentioned in the Book of Proverbs; that is, I don't drink to make it easier and more fun for me to get over on other people, but to dull the pain of having been gotten over on by the bullies. I probably ought to quit drinking. How can I find an AA meeting which would be more good than bad for me, considering my um, "social awkwardness?" Excellent point about the cure that's worse than what's being "cured." I admit I've used alcohol to ease my social inadequecies, but I've found it only make me feel at ease, like I'm fitting, and that it doesn't make me seem more normal. More entertaining perhaps, but not more normal. I don't have good words to voice my reaction to this post. Thank you very much for the time and courage it took to write it. I wish you great luck in the future.